The original - Flourless - Low glycemic. Certified organic grains. Certified organic by QAI. Low Glycemic: Certified by the glycemic research institute - Washington, D.C. All natural - No preservatives. The live grain difference! See back panel for details. As described in the holy scripture verse: Take also unto thee wheat and, barley, and beans, and lentils and millet, and spelt, and put them in one vessel, and make bread of it - Ezekiel 4:9. Ezekiel 4:9 Sprouted Grain Bread is inspired by the holy scripture verse: Take also unto thee wheat, and barley, and beans, and lentils, and millet, and spelt, and put them in one vessel, and make bread of it - Ezekiel 4:9. We discovered when these six grains and legumes are sprouted and combined, and amazing thing happens. A complete protein is created that closely parallels the protein found in milk and eggs. In fact, the protein quality is so high, that it is 84.3% as efficient as the highest recognized source of protein, containing all 9 essential amino acids. There are 18 amino acids present in this unique bread - from all vegetables sources - naturally balanced in nature. 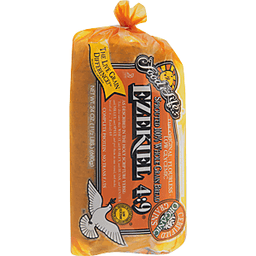 Ezekiel 4:9 Bread, made from freshly sprouted organically grown grains, is naturally flavorful and bursting with nutrients. Rich in protein, vitamins, minerals and natural fiber with no added fat. Try it served warm to release its exceptionally rich nutty flavor. This biblical bread is truly the staff of life. The miracle of the sprouts - Food for Life breads have - The live grain difference! Difference from most breads today, this unique bread is made from freshly sprouted live grains and contains absolutely no flour. We believe in sprouting the grains we use in our breads because sprouting is the best way to release all of the vital nutrients stored in whole grains (Source: Price-Pottenger Nutrition Foundation). To unlock this dormant food energy, maximize nutrition and flavor, we add just the right amount of water to healthy whole organically grown grains which are already bursting with nutrients. Beneficial enzymes are activated which cause the grains to sprout and become a living food. Our exclusive sprouting process not only significantly increases vitamins, but also causes a natural change that allows the protein and carbohydrates to be assimilated by the body more efficiently. And even better still, our exclusive baking process preserves these valuable nutrients and retains the important natural fiber and bran. You can see, taste, and smell the live grain difference! of Food for Life breads. As nutritious as they are delicious, Food for Life breads are the substance of a meal - not just something that holds a sandwich together. See the difference fresh sprouts really make. So when you're looking for nutrition in bread, reach for the sprouted grain breads from Food for Life and partake of the miracle. Your body and taste buds will know the difference! www.foodforlife.com. (915) 279-5090 - (800) 797-5090, Mo-Th 8-5, Fri 8-3 (PST). Glycemic Index: 36. Made in USA. 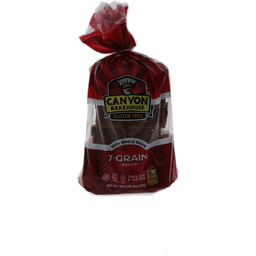 Canyon Bakehouse® Gluten Free 7-Grain Bread. 100% Whole grain. Certified Gluten-free®. Dairy, soy & nut free. 14g or more per serving. Net Wt. 18 oz (1 lb 2 oz) 510 g. Our mission is simple. We want you to Love Bread Again®. Our family is gluten free and we are passionate about making real food with wholesome, clean ingredients. We bake bread the old fashioned way and use only 100% whole grains. From our family bakehouse in the Rocky Mountains to your kitchen, enjoy eating without compromise. 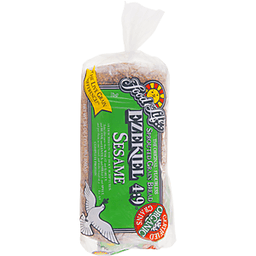 Please reach out and let us know if you love our 7-Grain bread! Note: Buckwheat is not wheat. It is naturally gluten-free grain. No GMO. Call: 888-566-3590. Email: info@canyonbakehouse.com. www.canyonbakehouse.com. The original - Flourless. Certified organic grains. Certified organic by QAI. Natural - No preservatives. Complete protein. The live grain difference! See back panel for details. As described in the holy scripture verse: Take also unto thee wheat and, barley, and beans, and lentils and millet, and spelt, and put them in one vessel, and make bread of it - Ez 4:9. Ezekiel 4:9 Sprouted Grain Bread is inspired by the holy scripture verse: Take also unto thee wheat, and barley, and beans, and lentils, and millet, and spelt, and put them in one vessel, and make bread of it - Ezekiel 4:9. We discovered when these six grains and legumes are sprouted and combined, and amazing thing happens. A complete protein is created that closely parallels the protein found in milk and eggs. In fact, the protein quality is so high, that it is 84.3% as efficient as the highest recognized source of protein, containing all 9 essential amino acids. There are 18 amino acids present in this unique bread - from all vegetables sources - naturally balanced in nature. 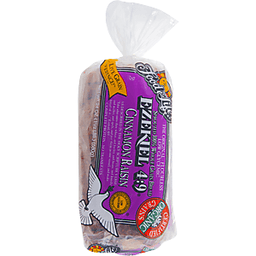 Ezekiel 4:9 Bread, made from freshly sprouted organically grown grains, is naturally flavorful and bursting with nutrients. Rich in protein, vitamins, minerals and natural fiber with no added fat. Try it served warm to release its exceptionally rich nutty flavor. This biblical bread is truly the staff of life. The miracle of the sprouts - Food for Life breads have - The live grain difference! Difference from most breads today, this unique bread is made from freshly sprouted live grains and contains absolutely no flour. We believe in sprouting the grains we use in our breads because sprouting is the best way to release all of the vital nutrients stored in whole grains (Source: Price-Pottenger Nutrition Foundation). To unlock this dormant food energy, maximize nutrition and flavor, we add just the right amount of water to healthy whole organically grown grains which are already bursting with nutrients. Beneficial enzymes are activated which cause the grains to sprout and become a living food. Our exclusive sprouting process not only significantly increases vitamins, but also causes a natural change that allows the protein and carbohydrates to be assimilated by the body more efficiently. And even better still, our exclusive baking process preserves these valuable nutrients and retains the important natural fiber and bran. You can see, taste, and smell the live grain difference! of Food for Life breads. As nutritious as they are delicious, Food for Life breads are the substance of a meal - not just something that holds a sandwich together. See the difference fresh sprouts really make. So when you're looking for nutrition in bread, reach for the sprouted grain breads from Food for Life and partake of the miracle. Your body and taste buds will know the difference! www.foodforlife.com. (915) 279-5090 - (800) 797-5090, Mo-Th 8-5, Fri 8-3 (PST). Made in USA. Canyon Bakehouse Gluten Free Bread Mountain White. Certified Gluten-Free. Net Wt. 18 oz (1 lb 2 oz) 510 g. Our mission is simple. We want you to love bread again®. Our family is gluten free and we are passionate about making real food with wholesome, clean ingredients. We bake bread the old fashioned way and use only 100% whole grains. From our family bakehouse in the Rocky Mountains to your kitchen, enjoy eating without compromise. Please reach out and let us know if you love our Mountain White Bread! Dairy, soy & nut free. No GMO. 100% Whole Grain - 12g or more per serving. Call: 888-566-3590. Email: info@canyonbakehouse.com. 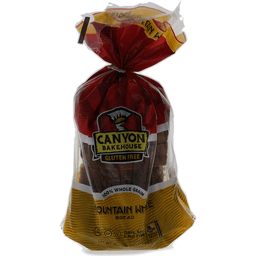 Visit: www.canyonbakehouse.com. The original - flourless - low glycemic. Certified organic grains. Certified organic by QAI. Low Glycemic: Certified by the glycemic research institute - Washington, D.C. Natural - No preservatives. Complete protein - no trans fat. The live grain difference! See back panel for details. As described in the holy scripture verse: Take also unto thee wheat and, barley, and beans, and lentils and millet, and spelt, and put them in one vessel, and make bread of it - Ez 4:9. Ezekiel 4:9 Sprouted Grain Bread is inspired by the holy scripture verse: Take also unto thee wheat, and barley, and beans, and lentils, and millet, and spelt, and put them in one vessel, and make bread of it - Ezekiel 4:9. We discovered when these six grains and legumes are sprouted and combined, and amazing thing happens. A complete protein is created that closely parallels the protein found in milk and eggs. In fact, the protein quality is so high, that it is 84.3% as efficient as the highest recognized source of protein, containing all 9 essential amino acids. There are 18 amino acids present in this unique bread - from all vegetables sources - naturally balanced in nature. 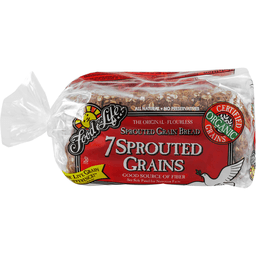 Ezekiel 4:9 Bread, made from freshly sprouted organically grown grains, is naturally flavorful and bursting with nutrients. Rich in protein, vitamins, minerals and natural fiber with no added fat. Try it served warm to release its exceptionally rich nutty flavor. This biblical bread is truly the staff of life. The miracle of the sprouts - Food for Life breads have - The live grain difference! Difference from most breads today, this unique bread is made from freshly sprouted live grains and contains absolutely no flour. We believe in sprouting the grains we use in our breads because sprouting is the best way to release all of the vital nutrients stored in whole grains (Source: Price-Pottenger Nutrition Foundation). To unlock this dormant food energy, maximize nutrition and flavor, we add just the right amount of water to healthy whole organically grown grains which are already bursting with nutrients. Beneficial enzymes are activated which cause the grains to sprout and become a living food. Our exclusive sprouting process not only significantly increases vitamins, but also causes a natural change that allows the protein and carbohydrates to be assimilated by the body more efficiently. And even better still, our exclusive baking process preserves these valuable nutrients and retains the important natural fiber and bran. You can see, taste, and smell the live grain difference! of Food for Life breads. As nutritious as they are delicious, Food for Life breads are the substance of a meal - not just something that holds a sandwich together. See the difference fresh sprouts really make. So when you're looking for nutrition in bread, reach for the sprouted grain breads from Food for Life and partake of the miracle. Your body and taste buds will know the difference! www.foodforlife.com. (915) 279-5090 - (800) 797-5090, Mo-Th 8-5, Fri 8-3 (PST). Glycemic Index: 43. Made in USA. 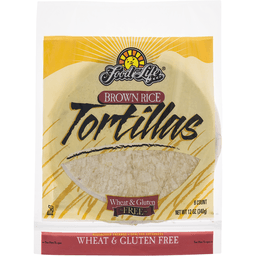 Food For Life's unique wheat 6 gluten-free Tortillas are specifically developed to he moist, delicious and easy to use. For the great taste of the southwest, warm tortilla before serving, stuff with pinto beans, potatoes, Longhorn or any cheddar and add your favorite salsa. The ideas are endless, lust fill with your favorite fillings for a tasty wrap. Great any time for a real treat! For more information on our other wheat and gluten-free products, please visit our website at: www.foodforlife.com, or contact us at: 800-797-5090. For information on gluten intolerance. contact Celiac Disease Foundation, Studio City, CA at: (818) 716-1513 or visit: www.cellac.org. www.foodforlife.com. 800-797-5090, M-Th 8-5, Fr 8-2 (PST). Please recycle. Made in USA. 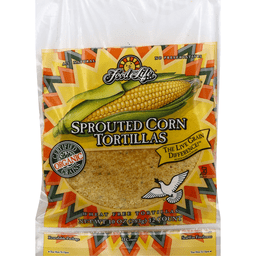 Food For Life® Sprouted Corn Tortillas. All natural. No preservatives. Certified organic grains. The live grain difference!™ Wheat free tortillas. Net Wt 10 oz (283 g). The live grain difference! Different than most corn tortillas today, these unique tortillas are made from freshly sprouted 100% organic whole kernel corn. We use no corn meal or corn flour. We sprout our corn first, then slowly produce into a "masa" using basic natural ingredients and gently press into these healthy and flavorful sprouted organic corn tortillas. We believe in sprouting the corn we use because sprouting is the best way to release all of the vital nutrients stored in whole grains*. To unlock this dormant food energy, maximize nutrition and flavor, we add just the right amount of water to healthy whole organically grown corn. Beneficial enzymes are activated which cause the corn to sprout and become a living food. Our exclusive sprouting process not only significantly increases vitamins and minerals, but also causes a natural change that allows the protein and carbohydrates to be assimilated by the body more efficiently. And even better still, our slow mixing process helps preserve the important natural fiber. You can see, taste, and smell the live grain difference!™ of Food For Life tortillas. See the difference fresh sprouts really make and partake of the miracle. Your body and taste buds will know the difference! No yeast. No added oil. No baking powder. Fun Facts: Also known as "maize", Corn has been grown in the Americas for thousands of years. Corn was the chief source of nourishment for many Indian tribes including the Mayans, Aztecs, Incas and other Indian tribes of North and South America. Early colonists first learned how to use corn from the Iroquois Indians of the pre New England area. For more information on our other wheat and gluten free products contact us at our phone number or visit our Food For Life website. Certified Organic by Quality Assurance International. *Source: Price-Pottenger Nutrition Foundations, Lemon Grove, CA. Please recycle. Call: 1-800-797-5090, M-TH 8-5, FR 8-2 (PST). Email: info@foodforlife.com. Visit: www.foodforlife.com. Full of taste - free of gluten. Dairy, soy & nut free. Certified gluten free. Eat well, smile often. Our mission is to show you a new way to approach gluten-free living. Don't waste another bite on bland, crumbly and tasteless food. Udi's sources natural ingredients to make delicious products that will fill your stomach and warm your soul. 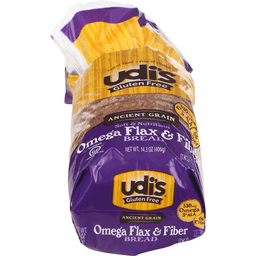 For more information on Udi's Gluten Free Foods visit us at www.udisglutenfree.com. 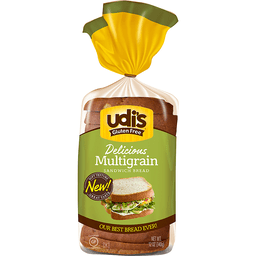 Facebook: www.facebook.com/UdisGlutenFree. Twitter: www.twitter.com/UdisGlutenFree. Ancient grain. 530 mg omega 3 (Per serving which is 33% of the 1600 mg daily value for ALA) ALA. 6 g fiber. Contains 6 g of total fat per serving. Full of taste - free of gluten. Soft & nutritious. Certified gluten free. Eat well, smile often. Our mission is to show you a new way to approach gluten-free living. Don't waste another bite on bland, crumbly and tasteless food. Udi's sources natural ingredients to make delicious products that will fill your stomach and warm your soul. www.facebook.com/UdisGlutenFree. www.twitter.com/UdisGlutenFree. 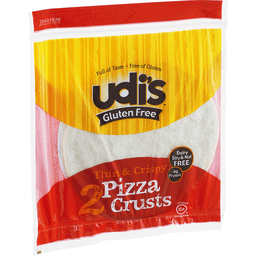 For more information on Udis Gluten Free Foods visit us at www.udisglutenfree.com.